For those of you who know me, you probably know that I can do some serious damage to a salad. Most nights that I eat at home a main portion of my dinner is salad mixed with some type of protein. 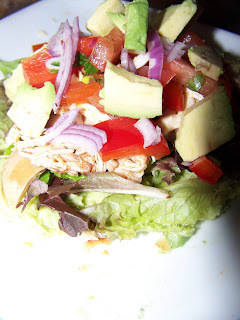 I love experimenting with new dressings, textures and flavors that can transform a ho-hum salad into something amazing. Knowing this, you can probably appreciate my extreme pleasure a few days ago when I received a huge box full of the fantastic Olivia's Organics salads in the mail. 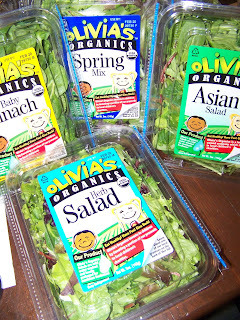 Now Olivia's have long been my favorite choice in salad greens. They are always fresh, their packaging allows them to keep for an abnormally long amount of time in the refrigerator, and their combinations of different greens allows me to experiment with all different types of flavors in my salads. This may have been one of the best packages I have ever received! The very night that I received the package, I was craving tacos, but not just your regular hard shell, pre mixed tacos-I wanted something fun, something new, and something a bit healthier. So I let my creativity flow. I decided on pulled chicken tacos, a simple salsa, a white bean substitute for guacamole, and the satisfying addition of some simple baby greens from Olivia's. 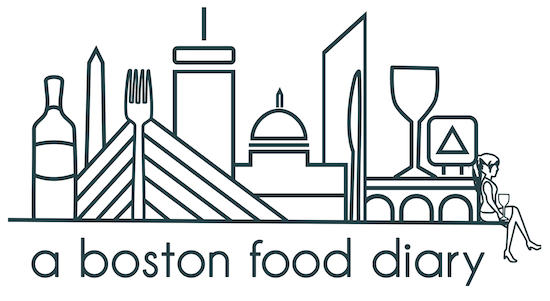 As some of you may have noticed on ABostonFoodDiary.com, I have recently begun a challenge- a challenge to complete 101 tasks in 1001 days. Approximately 50 or so of the tasks I have chosen are food related (shocking I know) and those are listed on the site HERE. One of those is try new ingredients, so when making my pulled chicken tacos-I decided to try something I've never done before- I made my first ever spice rub! Now I'm not going to give away all of the secrets to it, but it was loosely comprised of salt, brown sugar, hot pepper flakes, ground black pepper, Cayenne pepper, chili powder, and a few other additions (I'd wink at you but that might be strange). The end result was had the great properties of spicy while salty and sweet. 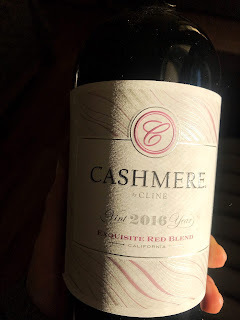 I liberally poured this over my boneless chicken breasts and thighs (white and dark meat is always a great combination) and then let them rest and soak in the flavors. Meanwhile, I started a medium stock pot with just a bit of canola oil on the bottom, and added chopped garlic, cilantro, and onion, salt and pepper. 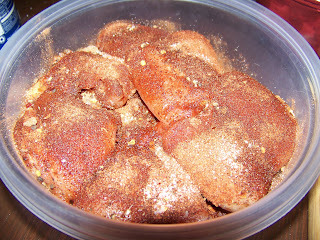 After those flavors had mingled for a bit, I added about a tablespoon of mustard powder. About two minutes later I added a large can of Sapporo beer, and about a cup of vegetable broth to the pot. I let that simmer for a bit, and then added the chicken to the pot to cook. While I waited the 40 minutes or so for the chicken to cook in their broth, I turned my attention to the accompaniments I wanted to serve with the tacos. The first task was to make my extra healthy dip. Now I love guacamole-even the bad stuff is good to me. I just think its fantastic. But, even though the fat contained in Avocados is "good fat" its still not great in large quantities, so I decided to make a white bean dip with many of the same flavors. I place a handful of cilantro, a Jalapeno pepper, and a can of Cannelloni beans into my food processor and blended with a small stream of olive oil until a creamy consistency. Then I made a very simple salsa of tomato, red bell pepper and cilantro to top the tacos. Finally I painted both sides of a few white flour tortilla's with canola oil, and placed them in a 400 degree oven. 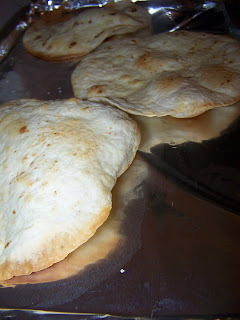 After just a few minutes the tortilla's had turned a nice golden brown and beautiful air pockets and sprung up throughout the surface making for a crispy treat. Finally, the chicken was done cooking, and I transferred it to a plastic container. Once it had cooled just a bit, and I was confident that any moisture had cooled internally in the chicken, I started to pull it apart with two forks separating the chicken into small strands as well as large chunks for texture change up. 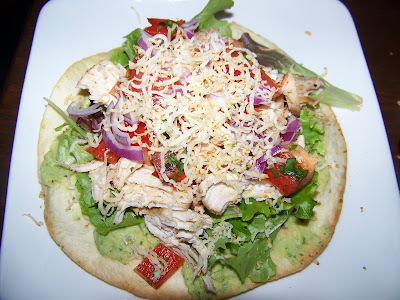 After I pulled the chicken apart, I then spread a layer of the white bean dip on one of the tortillas, topped that with a layer of Olivia's Organics Baby Greens, a layer of the pulled chicken, salsa, chopped red onion, and a quick shower of shredded cheese. For a more healthful option I also made a plate without the tortilla, but just spooned some of the dip directly on the plate and then added the other ingredients (and as you might have noticed-some avocado made its way onto my plate-oops). This was such a fun take on a taco! The bean dip and the chicken spice rub had just enough heat without being over powering and diminishing the rest of the flavors. The chicken itself had fantastic flavor- the spice rub had maintained its qualities throughout the cooking process and you could taste the different palate challengers of salty, sweet and spicy-all with an underlying savory vibe. The bean dip on top of the crunchy shell made a great contrast of textures with the creamy and the crisp. What I really loved though was that the salad greens really grounded the dish. Often times I find tacos are served with iceberg lettuce, and though the mighty iceberg definitely has its place in the greens family, it just doesn't add anything flavor wise. The baby greens added great flavor, as well as texture as they had a sort of toothsomeness that was really pleasant. Traditional by no means, but these tacos were one for the books. Delicious!